Earn CCH's at our Winter Workshop on December 19, 2012. Click the link below for more information. This is the time of year when all Commercial Pesticide Applicators need to renew their pesticide applicator license with the Office of Indiana State Chemist. 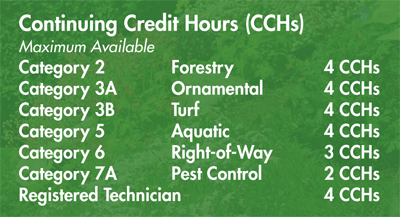 As such, it is also a good time to review your current Continuing Credit Hours (CCH’s) going into the end of the year. Your certification remains in force through December 31 of the fifth year following renewal. However, the applicator license and business license must be renewed each December. You should now have received that renewal invoice from the State Chemist Office and it must be paid by December 31, 2012 to avoid a penalty. The minimum number of CCH’s required for renewal of each category relevant to members of the Indiana Professional Lawn & Landscape Association, is as follows. A commercial applicator can accumulate CCH’s only in the category in which he or she is certified at the time of participating in a specific training program. A commercial applicator can accumulate a maximum of one-half (1/2) of the total number of CCH’s required at any one training program. CCH’s accumulated by a commercial applicator in excess of the total number of CCH’s required shall not be carried forward to the next certification period. IPLLA encourages every commercial applicator to keep close track of your individual accumulated CCH’s as well as the five year expiration date of your commercial applicator license. The CCH program is one of the best ways possible to maintain your commercial applicator license and to keep yourself up-to-date on changing trends and new technology available to our industry. The Indiana Professional Lawn & Landscape Association is joining forces with the Office of the Indiana State Chemist to offer Core Exam Testing at various regional and statewide meeting sites starting in 2013. The announcement comes as the association prepares its education program for next year. “One of our real concerns has been the lack of statewide Core Exam testing opportunities for new industry employees” said IPLLA Executive Director Bob Andrews. The new program will be launched starting with the association’s regional meetings scheduled to be held in February in northern, central, and southern Indiana. Such testing will also be offered at the annual Summer Field Day scheduled to be held in Danville on August 22, 2013. Those firms registering to attend such an event will have the chance to register employees to take the Core Exam as part of the educational event. The testing opportunity will be limited to 30 people at each site who will then earn appropriate Continuing Credit Hours (CCH’s), for that event, should they successfully pass the Core Examination. Detailed planning is now underway and more information on the program will be announced online and at the IPLLA Winter Workshop which will be held December 19th at The Oak Hill Mansion in Carmel. IPLLA President Kyle Chaffee, Owner of Chaffee Turf Service in Batesville, says this offering will expand testing opportunities throughout the state and takes place during critical hiring periods of the year. Watch www.iplla.com for updates on this new and exciting offering from IPLLA. In early October, every member firm of IPLLA will be receiving an invitation to submit a name in nomination for election to the IPLLA Board of Directors. Board Members serve three year terms and are asked to attend four Board Meetings each year as well as participate in hosting the Summer Field Day, Winter Workshop, and Regional Meetings. They may have the opportunity to serve as an officer of the association or as Chair of one of our committees. Most importantly, Board Members get the opportunity to grow--not only professionally-- but personally. Being a part of this group of industry leaders literally “rubs off on you”. You will meet fellow professionals that you never would have met, learn new business practices, and be in the middle of shaping the future of the lawn and landscape industry. Being a Member of the IPLLA Board is an investment that clearly pays off. Ask any current or past board member and they will be happy to tell you of the knowledge and experience they have gained by serving on the IPLLA Board. So when you get the Official Nomination Form, consider nominating yourself, or someone you believe would bring enthusiasm and fresh ideas to the Board. Nominations will be mailed on October 1 and due back by the end of the month. 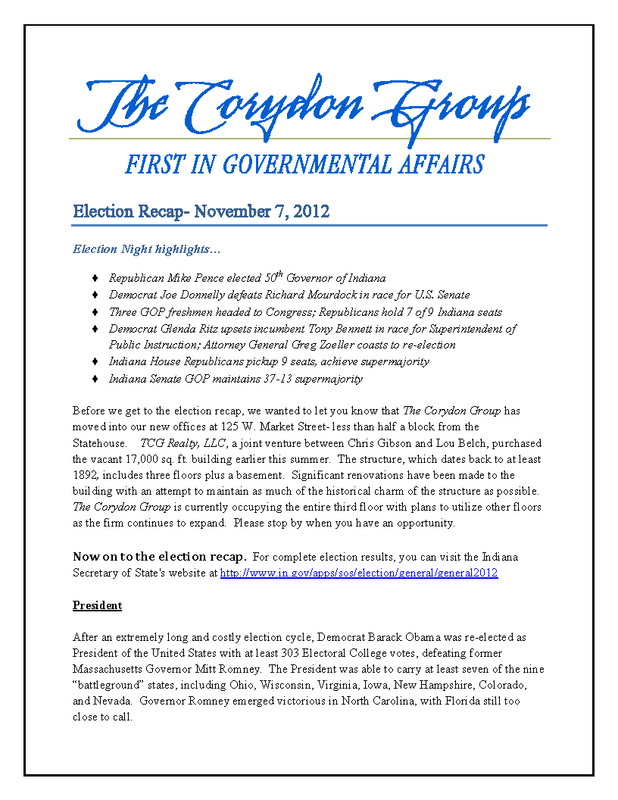 Our annual election will be held in November. Thanks again for you support of the Indiana Professional Lawn & Landscape Association. It was the summer of 1994, and I had just graduated from college and was entering the lawn care business. During this time, I had been researching my options for equipment and chemicals and working on my lawn care program. I had just joined the Indiana State Lawn Care Association--now called IPLLA. I received a brochure through the Association about an upcoming summer field day that August, and I thought it could be a great opportunity to make the most out of my membership and learn something. Boy, was I ever right! During my first summer field day, I developed a relationship with an insurance provider and saved over half on my business owner’s insurance, located sources of equipment, found a reliable chemical supplier, and developed what has turned out to be long-term relationship with my sales representative. I didn’t realize at the time how beneficial that field day event really was, but looking back on it, I appreciate how much my membership had paid off for me--I didn’t know how much I didn’t know! Being an active member of IPLLA has helped our company grow professionally. The numerous educational events held throughout the year have been invaluable, and I rarely miss one. In addition to earning CCHs at the events, I am able to speak to other business owners who face the same challenges I do, and I always learn something. I’m sure I learn as much from the classroom sessions as I do from talking to others, whether the conversation takes place in the hallway, over lunch, or at an exhibit booth. Joining IPLLA 18 years ago was one of the best decisions I’ve made. This Thursday is our 26th Annual IPLLA Summer Field Day and I hope you will join us! See you there! Register ONLINE for the 2012 Summer Field Now! Click Here! Kristine Guerra’s article “Don’t Be Fooled: Drought isn’t Over” really was one of the first things I have read that called attention to one of the real problems associated with the Marion County Watering Ban. The landscape around our homes and businesses is valuable. It has suffered significant damage from heat stress and lack of water. It is not going to magically recover without proper care, and soon. In order to do so, the landscape will need some water, and without water, the landscape industry cannot go back to work. Two of our association members, Berger Hargis and All Green were both quoted in the Star article as to how much lost revenue the watering ban has cost their respective businesses. That translates into lost income for their companies and lost or reduced work for literally thousands of workers employed in the lawn and landscape industry. This is more than about aesthetics; it is about people and their jobs. The loss of those jobs hurts everyone involved, including the City of Indianapolis. 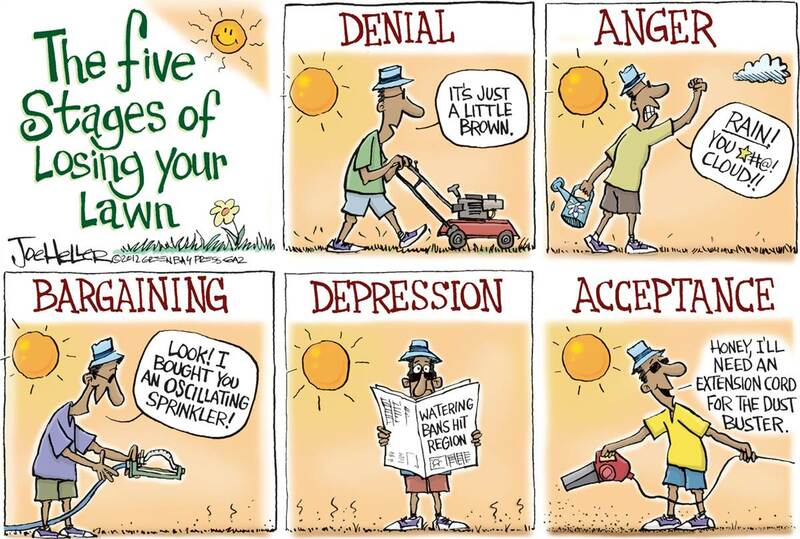 When this is all over, there will be time to thoroughly investigate all the reasons why Citizens Water needed a “watering ban” rather than “watering restrictions”. But now, we need time to go to work. There is a very short window between September and December and the landscape will need every day of it to recover. So will the landscape industry. Mayor Ballard. Please lift the ban. GIA Board of Directors had a conference call with two senior members of Mayor Ballard’s (Indianapolis) staff on Wednesday regarding the Marion County water ban. The IPLLA is a member and supporter of the Green Industry Alliance (GIA). 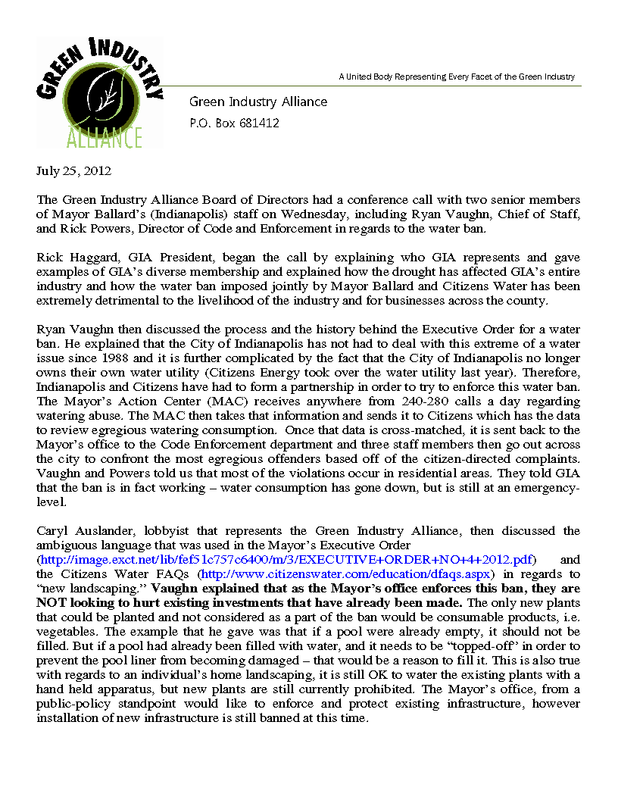 The GIA Board of Directors had a conference call with two senior members of Mayor Ballard’s (Indianapolis) staff on Wednesday, including Ryan Vaughn, Chief of Staff, and Rick Powers, Director of Code and Enforcement in regards to the water ban. A recap of the conference call details and clarification of the water ban in MARION COUNTY are in the document below. We received this information from the Town of Fishers regarding the installation, repair and maintenance of irrigation systems. As per our phone conversation, the Town of Fishers will allow Irrigation companies to continue to install, repair, and maintain new and existing irrigation systems. We understand that brief water use will be required to verify installations, repairs, and or maintenance of irrigation systems. With that said, if our water emergency becomes more severe, additional restrictions may be put into place that will change our current position regarding irrigation water usage. If more severe restrictions are put into place, the Town of Fishers will issue a press release and post updated information on our website at www.fishers.in.us Please inform your customers that as the Town of Fishers does allow new seedlings or sod that was installed prior to the Water Emergency Declaration July 16, 2012 to be watered by a hand-held nozzle with shut off valve only not by sprinklers or irrigation. Contact me if you have any further questions or need clarification of any of these statements. 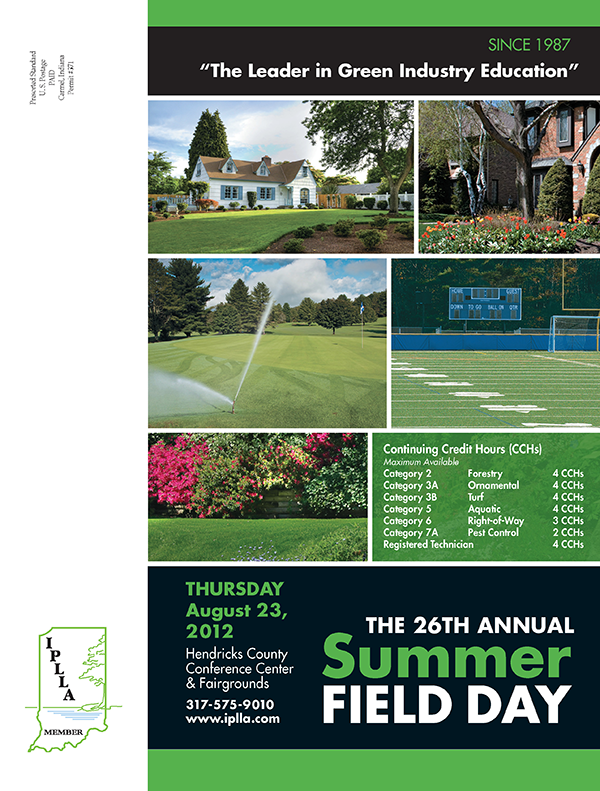 On August 23rd, the Indiana Professional Lawn & Landscape Association will hold its annual Summer Field Day at the Hendricks County Fairgrounds in Danville. Registration information has now been mailed and is also available on line by clicking here. Due to our unprecedented drought and long periods of hot weather; we are asking each of our speakers to address the topic in terms of their area of expertise. This will provide all of us with an excellent opportunity to learn more about the long term affects of the drought on plant life, and how we can position ourselves to help properties recover. No where else will you be able to have access to 15 top experts in the green industry, all of whom have extensive backgrounds in turf management, ornamentals, disease, insects, fertilization, grounds management, and much more. Not many of us have experienced a growing season like this one, but all of us must now plan the best course of action to help our properties recover from it. The 2012 Summer Field Day is preparing to offer you the latest and most comprehensive information on drought recovery. This is a great opportunity for us all to learn and we’ll look forward to seeing you on August 23rd.